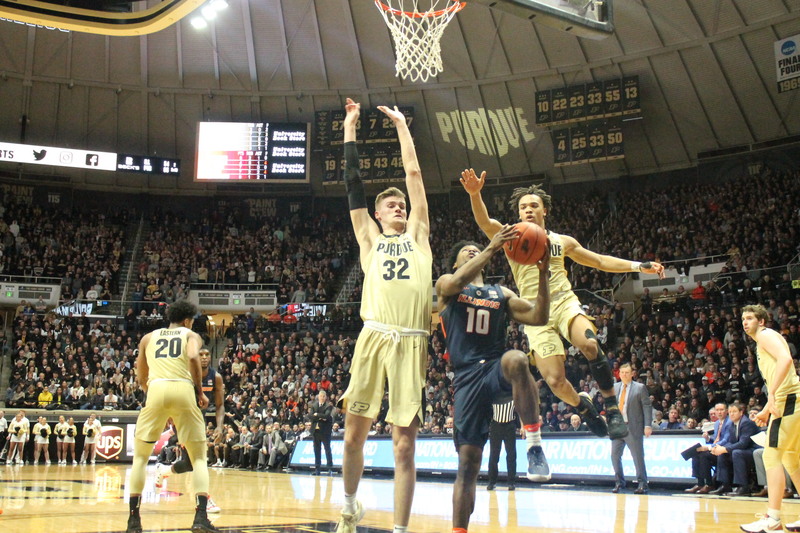 Purdue junior guard Carsen Edwards has been named a United States Basketball Writers Association second-team All-American, the organization announced today. The USBWA is one of the four outlets used when selecting consensus All-Americans, joined by the Associated Press, the Sporting News and National Association of Basketball Coaches (NABC). He was earlier named a third-team honoree by the Sporting News. Last season, Edwards was named to three of the four teams, being left out of the USBWA All-American awards. Edwards officially becomes a two-time All-American, one of 12 in Purdue history and the first two-time All-American at Purdue since Glenn Robinson in 1993-94 (honorable mention selections are not considered All-Americans). It marks the third straight year that a Purdue player has been named an All-American. Caleb Swanigan was honored as a consensus first-team selection in 2017, while Edwards was selected in 2018. Edwards, who is named one of five finalists for the Jerry West Award which honors the nation’s top shooting guard, enters this week’s NCAA Tournament with a 23.0 scoring average, tops in the Big Ten and the most for a Big Ten player since Minnesota’s Quincy Lewis in 1999 (23.1 PPG). He has set the Purdue single-season (107) and career (253) 3-point records already and is also averaging 3.5 rebounds and 3.0 assists per game. Edwards recently moved into ninth place on the Purdue career scoring list (1,781) and his 1,781 points are the most for a Purdue player in school history through his junior season. In 32 games this year, Edwards has scored 735 points, already making him one of five players in school history with multiple 650-point seasons. His 735 points rank sixth on the Purdue single-season list, and his total is the most for a Boilermaker player since Glenn Robinson scored a school-record 1,030 points in 1994. Edwards was a three-time Big Ten Player of the Week this season and was the Blue Ribbon Yearbook preseason National Player of the Year. He entered the year as one of just three returning All-Americans in college basketball (North Carolina’s Luke Maye and Virginia’s Kyle Guy). Edwards and the Boilermakers won their second Big Ten title in three years. Purdue earned the No. 3 seed in the NCAA Tournament’s South Region and will face No. 14-seed Old Dominion on Thursday, tipping at approximately 9:50 p.m. ET, from Hartford, Connecticut.